Belum Valley is an entomologist’s paradise. One of the commonly found is the Lantern Bug (Lanternaria Candelaria Fulgoridae). The family Fulgoridae is a large group of hemipteran insects, especially abundant and diverse in the tropics, containing over 125 genera worldwide. They are mostly of moderate to large size, many with a superficial resemblance to Lepidoptera due to their brilliant and varied coloration. Various genera and species (especially the genera Fulgora and Laternaria) are sometimes referred to as lantern flies, though they do not emit light. The head of some species is produced into a hollow process, resembling a snout, which is sometimes inflated and nearly as large as the body of the insect, sometimes elongated, narrow and apically upturned. It was believed, mainly on the authority of Maria Sibylla Merian, that this process, the so-called lantern, was luminous at night. Carl Linnaeus adopted the statement without question and coined a number of specific names, such as laternaria, phosphorea and candelaria to illustrate the supposed fact, and thus aided in promoting a belief which centuries of observations have failed to confirm. 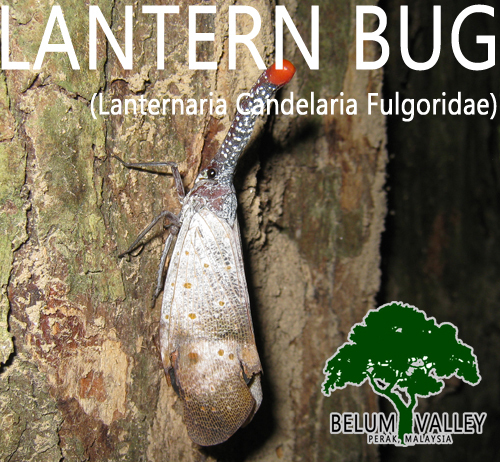 Most common areas where Lantern Bug can be found is surrounding Sungai Enam areas in southern part of Belum Valley.